These marshmallow ropes are super fun to make. Marshmallows are made exactly the same way as an Italian meringue – adding hot sugar syrup to stiff egg whites – but with the addition of gelatine to make them set. We suggest making this with friends, as the marshmallow mixture sets quite quickly and you need a few hands on deck to pipe the ropes before it does. Good messy fun. Mix the icing sugar and cornflour together in a large bowl. Place a very long sheet of baking paper along your work surface. Using a sieve, dust very generously all over the baking paper with the icing sugar and cornflour mixture, reserving some of it for use later. Put the egg whites, salt and 1 tablespoon of the caster sugar into the bowl of a stand mixer, fitted with the whisk attachment, or use a clean glass bowl and a hand-held whisk. Don’t start whisking yet. Put the leaves of gelatine into a shallow bowl of cold water and leave them for 5 minutes to soak and become soft. Meanwhile, put the liquid glucose and the 150ml of water into a heavy-based saucepan with the remaining caster sugar. Place over a medium heat and stir with a heatproof spatula to gently dissolve the sugar (this takes 5–10 minutes). Once the sugar has dissolved, turn up the heat and bring to the boil. Attach a sugar thermometer to the pan and continue to boil without stirring until the syrup reaches 120°C. Take the pan off the heat. Now turn the mixer on to a medium speed and whisk the egg whites until stiff peaks form. Meanwhile, take the leaves of soaked gelatine out of the bowl and squeeze the excess water out, blotting them as dry as you can with a clean tea towel. Add to the hot sugar syrup and stir until the gelatine has completely dissolved. Once the egg whites are at stiff peaks, crank up the whisk to a high speed while you add the hot syrup in a steady stream. Be careful to add the syrup directly to the egg whites, without it touching the side of the bowl or the whisk on the way down, otherwise it will cool before it hits the eggs. When all the sugar syrup has been added, continue to whisk on high speed for 5 minutes, until the mixture is cool and the bowl feels hand temperature. The mixture should be glossy and doubled in volume. This is a bit of a two-woman job. Very quickly, divide the mixture roughly between three bowls. To one bowl, add the pink colouring; to the next, add the blue; and to your final bowl, add the yellow. 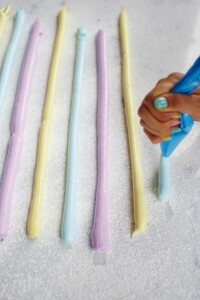 Stir quickly to evenly combine the colours, then transfer to three disposable piping bags. Cut off a 1.5cm tip with scissors at the end of each bag (there is no need for a nozzle), and quickly get piping long straight ropes of marshmallow on to the dusted baking paper. Leave to set for 5 minutes, then lightly dust with a little more of your icing sugar and cornflour mixture. Leave the ropes to set until they are no longer sticky to the touch, and are easy to handle without breaking apart. This will take about 45 minutes to an hour. Don’t leave them for too long, or they will set, becoming hard to twist, and may crack. First, dust your hands with some of the remaining icing sugar and cornflour mixture. Now roll one rope of each colour back and forth in the mixture so that they are completely coated. Lay the three colours of rope side by side and skewer all three with a toothpick at one end. Carefully twist (or plait!) the ropes tightly, then skewer the other end with another toothpick to hold the twists in shape. Repeat with all the ropes. They can be eaten immediately, but won’t hold their twisty shape unless you let them set at room temperature for 24 hours to dry completely. The next day, remove the toothpicks and the twists will miraculously stay in their lovely shape. The ropes will keep fresh for 1 week in an airtight container. Full recipe & many others like it in Meringue Girls Everything Sweet – a signed copy can be bought here.